Not many people know this but besides designing cars, Porsche also built tanks during World War II. It was this titbit of history that crossed my mind when I first sunk into the leather seats of the Porsche Macan Turbo Performance Package (PP). But while it might be built like a tank, it drives like a dream. When the German luxury automaker first launched its SUV – the Cayenne – in 2003, many eyebrows were raised. It soon became one of the brand’s most popular cars and paved the way for other luxury marques to build its own SUV variants. So, when Porsche unveiled the Macan (which means ‘tiger’ in Javanese) in 2013 a decade after the Cayenne, the market had gotten used to luxury SUVs. The Macan is smaller and more masculine-looking than the Cayenne. It’s marketed as a luxury crossover but with the performance of a sports car. The latter certainly rings true and for the recently updated Porsche Macan Turbo PP, it’s becoming evident that Porsche has mastered the art of combining control, aggression and comfort in a solid package. If you’ve never had the opportunity to drive a Porsche before, it’s a lot like eating ice cream, one that will never melt, on a hot day in a temperature-controlled swimming pool. Quite the analogy but it’s the only way I could think of to describe bliss, no matter the conditions around you. The Stuttgart engineers have thought of everything, both for the inside and outside of the car. The Macan PP is powered by a silky smooth 3.6-litre V6 turbo engine that’s mated to a seven-speed automatic transmission. One can’t work with the other and in the Macan PP, both combine perfectly in unison to create a pleasurable driving experience. Whether you’re inching along in bumper-to-bumper traffic or cruising along the highway, the car is quite the treat. While the sound of the engine isn’t exactly awe-inspiring (which your neighbours will thank you for), the growling bass note it emits just when you turn the key (no start/stop buttons in a Porsche; as is motorsport tradition, you still have to use a key) is still incredibly satisfying. And for such a big car, the agility of the Macan PP is unsurpassed. Corners, turns and twists are easily tackled thanks to the highly accurate steering, and cramped carparks are not a problem in spite of its size. The PP variant rides lower than the normal Macan Turbo and comes with bigger brakes that are sorely needed due to how fast it accelerates. Standstill to LTA letter speeds take about four and a half seconds and the Macan reaches a top speed of 272kph. 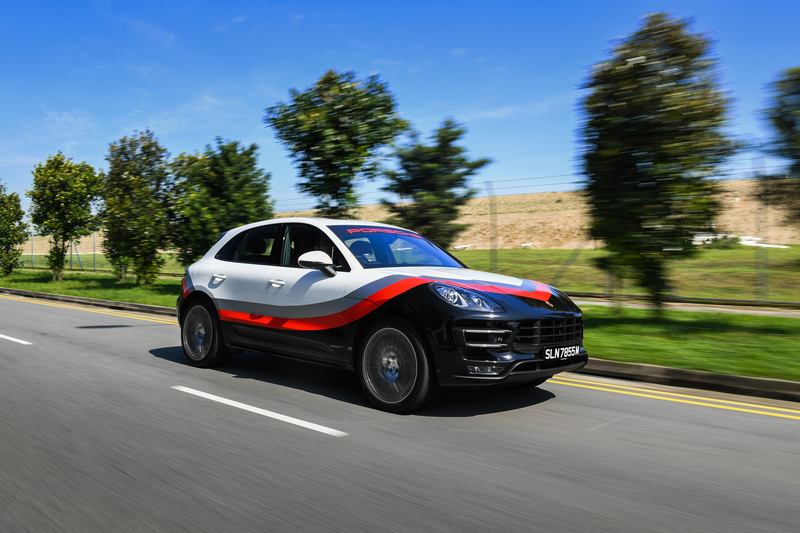 For motorsport gaming fans, you’ll be thrilled to know that the Macan PP with the unique livery, pictured in this article, was also featured in Forza Horizon 3. It’s the only country in the world with such a livery and a fun fact you can take with you the next time you’re discussing about cars with your friends.